Homegames workshopDaemon Primarch Mortarion – How does he perform on the table? Greetings, readers and fans of Daemon Primarchs, Death Guard or all things Chaos! We thought we’d give you guys a run down of how the Angel of Plagues performs on the table as we have managed to crank out a couple of games with him over the weekend. It’s needless to say the model is fantastic and whilst it’ll take a while to paint it’ll no doubt be worth it. If you’ve not had a chance to catch up on our other Death Guard items, do take a look. We managed to pit Mortarion into two of games over the weekend (a 2000 point game and a 75PL game). The first 2000 point game was against a Carcharodon force which rather unfortunately wound up in a deployment that had them defending the final bastion on the damned planet they inhabited. They faced Plague Marines, Poxwalkers and Bloat Drones on all sides. It couldn’t possibly have gotten any worse…until Mortarion showed up. Mortarion makes good use for cover (to some extent, those wings are enormously difficult to hide!) so with his 12″ movement not being as quick as we would have dreamed it was essential to keep him protected. Thankfully the new Cloud of Flies stratagem from the Death Guard Codex is perfect for this as he cannot be shot at unless he is the closest visible model. The Lantern works astonishingly well against characters and light vehicles. 18″ range is nothing to sniff at, especially when he hits on a 2+. It works as a beam weapon (hello, 7th edition!) and so you target a unit, specifically the nearest visible model in that unit, and anything under the line draw from the base of Mortarion to that model is hit by the weapon. It is not a Plague Weapon, though, so it does not re-roll 1’s to wound. Is he as frightening on the table as his outward exterior may indicate? Yes. Yes he is. For the fight phase Mortarion is devastating before even swinging his scythe. 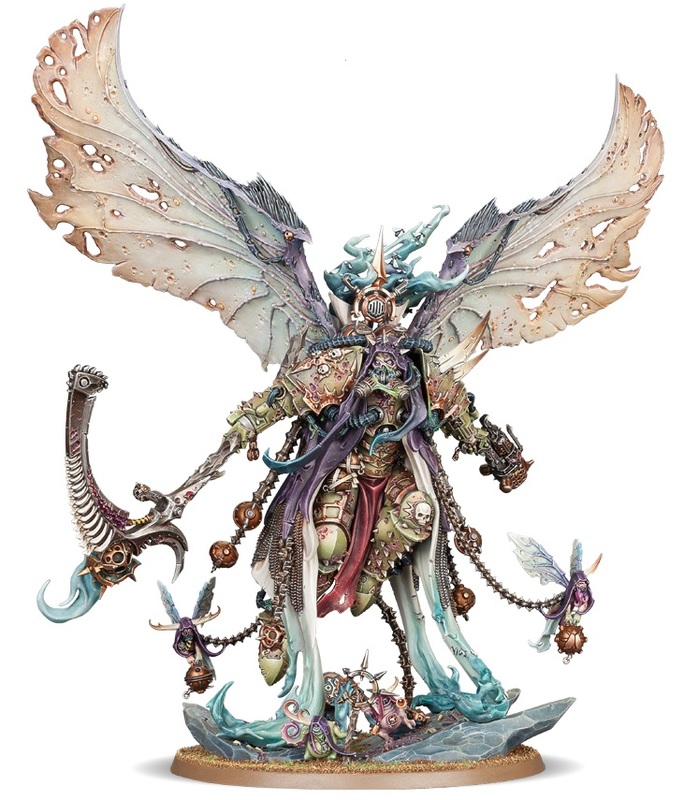 At the start of the fight phase Mortarion has a chance to inflict mortal wounds on any enemy units within 7″ of his. So before Silence has a chance to start cutting enemies down Mortarion corrupted aura starts melting people away into puddles. Perfect for softening up characters and vehicles. In my opponents case, with all of his units bunch up together in a tight circle, several Intercessors and a Hellblaster were felled from this alone. Now, for Silence, Mortarion’s famed scythe…this thing is horrifying. It comes in 2 different styles of attach. Reaping, which allows you to deal 18 attacks total with a good amount of strength and AP. Or, Eviscerating which has Mortarion deal 6 attacks as his standard value, but at double his strength and D6 damage per wound. That’s the potential to do 36 wounds! Redemptor Dreadnought? Gone in two turns of combat after a bad first roll. Dunecrawler? Gone in one round of combat. Every character within range? Cut down mercilessly. My opponent and I decided to run a test after this game to see if Mortarion would struggle against an Imperial Knight. Whilst he took around 4 wounds getting up close to it, once within close combat after the charge I rolled for the Eviscerating attack and dealt 24 wounds to the Knight, killing it in a single round of combat…truly devastating. The Nurglings referred to as his “Attendants” also get to attack in the fight phase. But at an adorable Strength 2, I’d not count on them taking down a Baneblade anytime soon. The second game against Genestealer Cults fared quite similarly in a Meat Grinder mission with the Death Guard pressing the assault against embedded cultists with Militarum detachments, including the might Stormlord tank. We house-ruled that Mortarion showed up later in the game as not to simply fly over to his defensive line and wreak havoc on everything too quickly. Turn three he showed up, turn four he was in combat with the Stormlord, turn five the Stormlord was rubble, debris and corpses with Mortarion suffering no more than 4 wounds to its Vulkan Mega Bolter, Lascannons and everything else it had. My advice? Only play Mortarion in large games (2000+) and preferably with plenty of super heavies on the board or else you’ll run out of friends very, very quickly. His resilience and damage are a sight to behold and the only thing I want to do now is see how he manages toe-to-toe with Magnus. As ever, check back for regular updates via our Facebook and if you wish to support us and our content you can do so via our Patreon. You are absolutely right! Good spot. Guess my Poxwalkers will have a little more survivability from here on out, heh.